Lt. Governor Kim Guardagno, a direct party to the Hoboken conversation last May with Mayor Dawn Zimmer concerning Sandy aid is denying the allegation she made any "direct threat" to the Hoboken mayor linking hurricane relief to approval of a proposed massive development in the Mile Square City for the Rockefeller Group. "Mayor Zimmer's version of our conversation in May of 2013 is not only false but is illogical and does not withstand scrutiny when all of the facts are examined," Guadagno said during an event to commemorate Martin Luther King Jr. Day. "Any suggestion that Sandy funds were tied to the approval of any project in New Jersey is completely false." "Standing in Union Beach today with some of the mayors whose towns were devastated by Sandy and also being a Sandy victim myself makes the mayor's allegations particularly offensive to me." "I am genuinely disappointed that Lieutenant Governor Guadagno has lived up to her promise that she would deny linking Hoboken's application for Sandy hazard mitigation funding with expediting a private development project. I met with the U.S. Attorney for over two hours yesterday, answered all their questions and turned over my journal in which I described my conversations with the Lieutenant Governor and Commissioner Constable. I stand by my word, remain willing to testify under oath, and I will continue to answer any questions asked of me by the U.S. Attorney's office." On Sunday, Mayor Zimmer expressed confidence the Lt. Governor would tell the truth of their conversation at the Hoboken Shoprite last May verifying the mayor's allegations if she did so "under oath." 2011 at the July 1st swearing in of council members at Hoboken City Hall. The escalation in a war of words today means the battle on what transpired is sure to continue with political implications for all and a national focus on the possible impact for Gov. Christie in his effort to be a presidential candidate in 2016. Last night the Hoboken mayor's office released a statement saying she had met with the US Attorney's Office over hours discussing the controversy at the request of the law enforcement agency. The Lt. Governor is a former sheriff and US Attorney in Newark and worked with Gov. Chris Christie in his lead role as US Attorney in the Newark Office. Here is the full transcript of the mayor's appearance yesterday on CNN. The question of timing in the mayor's coming forward is discussed at length. CROWLEY: New Jersey governor, Chris Christie's camp is pushing back hard against claims that his administration threatened to withhold superstorm Sandy relief funds for political reasons. Hoboken mayor, Dawn Zimmer, says Christie administration officials indicated that her city would not receive aid if she failed to support a development project favored by the governor. In one of several handwritten notes about the governor that she has made public, Mayor Zimmer wrote, "I thought he was honest. I thought he was moral. I thought he was something very different. This week, I found out he's cut from the same corrupt cloth that I've been fighting for the last four years. I am so disappointed. It literally brings tears to my eyes." CROWLEY: ...when a couple of officials you say -- said to you, listen, Sandy relief aid will in fact may be jeopardized if you don't go along with this redevelopment plan. Why are you here now? ZIMMER: Well, you know, back in May when the lieutenant governor came and very directly said to me that these two things are connected, I -- you know, I didn't think anyone would believe me. I really didn't. I mean I do, looking back, probably should have come forward but I really didn't think anyone would believe me and quite frankly, if I came forward, no one believes me, then I'm going to put Hoboken in an even worse position and my number one priority as a mayor of Hoboken is to fight to make sure that we can get as many Sandy funds as possible. That's my number one priority. And I was really concerned that if I came forward, no one believed me, that we would really be cut out of the Sandy funding. But as I watched the coverage with bridge-gate, you do see parallels. I just felt I had an obligation to come forward and as I look for the second tranche of funding come through, I'm concerned we're going to be cut out. CROWLEY: So -- but we have seen since this happened in May, which I have recorded in your diary, we have seen you complement the mayor. We have seen you several months later say in a tweet, I'm so glad that Chris Christie is our governor. So can you square that for me? Because as you know, coming at this point, what the Chris Christie office says is this -- this is just politics. Why can this not be seen through a political lens? ZIMMER: Well I mean that's part of the reason that this was so hard because I do have a really -- I did have a really good relationship so I couldn't believe that they were doing this. The bottom line is that the Christie administration's response is one of deflection. I mean the major question is, did they connect Sandy funding, Hoboken Sandy funding to the Rockefeller project. The fact is that is what they did. I'm coming forward. I'm sharing my story directly. I'm here talking to you. I'm sharing my journal. I'm offering to testify under oath. What are they doing? They're hiding behind spokes people and in fact the lieutenant governor was reached directly by the Bergen Record and she declined to comment. I believe if and when she is asked to testify under oath, the truth will come out because I believe she will be truthful and she will tell the truth. CROWLEY: OK. Anything that connects directly to Chris Christie on this? I mean I understand that he had a relationship with -- you're talking to his lieutenant governor, that you're talking to others in his administration that he has a relationship with this Rockefeller group. But, is there -- did he ever say anything to you? Did you ever not get funds? I know you didn't get everything you wanted, but I imagine (ph) that's true of most cities in New Jersey. ZIMMER: Well, I think we really got shortchanged on the funding. We've been saying from the very start that we have severe needs and that we need to look at this comprehensively and we've been asking them again and again. Now the fact is that she came, lieutenant governor pulled me aside and said essentially, you got to move forward with the Rockefeller project. This project is really important to the governor. And she said that she had been with him on Friday night and that this was a direct message from the governor. CROWLEY: So she said -- she said that to you. ZIMMER: She said that to me, is that this is a direct message from the governor. I was with him on Friday night. CROWLEY: Again, if this happens in May, you've got a city that was just devastated by super storm Sandy that needs these funds and needs them immediately, not you know, two or three years from now. So in May you had this conversation and the lieutenant governor says to you, this is a direct message from Chris Christie, get behind this project, or funds may be in jeopardy for your recovery. And then in August I think is when you tweeted, "I'm so glad he is governor of New Jersey." It is just hard to put those two things together. ZIMMER: Well, again, I mean I had to basically almost set aside what she said to me because it is unbelievable, but it's true. It's true and I'm coming forward and I just didn't feel that we were going to be able to get the funding. I was concern the people weren't going to believe me. I mean it is stunning. It's outrageous, but it is true and I stand by my word. And like I said, I'm willing to testify under oath and I think when she testifies under oath we're going to see -- if she's asked to testify under oath, I think we're going to see the truth come out because I believe she will be truthful under oath. And I think you look at their response. They did not respond to the number one question, are they linking Hoboken Sandy funding to the Rockefeller project. The fact is, they are. My number one priority, again, is to do what's right for Hoboken, to make sure that we can get that Sandy funding. At the time I just didn't think that they would -- anyone would believe me but I'm coming forward as we look at these parallels. The parallels are that you have -- the Christie administration using their authority to try and get something. I don't know what they were trying to get in the bridge gate but I do know what they're trying to get in Hoboken, they're holding our Sandy funds hostage in order to get pushed through and expedite the Rockefeller project. CROWLEY: I did speak to someone inside the governor's office this morning and they said, listen, our first pot was $300 million. The request from Hoboken was $100 million. They got $70 million. And they said, when you look across the state of New Jersey, all of these places were hurting and needed more money than at that point they obviously had, that $70 million out of a $300 million pot at that point is pretty good, it's almost one-third of the funds. ZIMMER: Well, actually, the $70 million that the governor is taking credit for, the majority of that is from the flood insurance program that residents and businesses have paid themselves. They're paying premiums and they're getting those flood insurance programs so that has nothing to do with the $70 million and the bottom line is we applied for over a $100 million and we got just, you know, a little bit more than $300,000. Those numbers stand. I mean it's -- they're playing games with the numbers and it is a deflection. The majority of that $70 million that they are talking about is from the flood insurance that they were not responsible for administering. ZIMMER: I'm sorry. Can you repeat that question? CROWLEY: Sure. Have you spoken to any other mayors in New Jersey that have similar stories? ZIMMER: I've spoken to Mayor Fulop and obviously I know his story of what happened to him. They, too, I think have not gotten that much Sandy funding. And for him, he saw something very clear, you know, happen where they had some important meetings set up, day- long series of meetings that he was supposed to really have the opportunity to them -- for them, his whole administration, to understand what the challenges that Jersey City was facing and those meetings were cut off right away. CROWLEY: There are lots of disasters that I've covered and always in the aftermath there is -- particularly if they're kind of statewide, there's someone who says, I'm not getting enough money, or the feds aren't giving us enough money, or the state aren't or the insurance company, because it is just so overwhelmingly awful that it is almost impossible to put everything back in place as it was. Could it be that the reason you're not getting the funds you want is not about this but about the fact that there still are limited funds? I'm told again by the New Jersey governor's office that when the next -- when the president approves the next round of aid, certainly Hoboken is going to get some. So have you seen yet the results of the threats you say you got? ZIMMER: I think it has come, yes. I think it has come to fruition. I think it has come to fruition in the first round and I'm not going to stand silent for the second round and have Hoboken not get funding. I mean we deserve our fair share. We deserve some of this funding. We've seen it happen in the first round and I'm not going to stand aside. And the bottom line is she came and she made a direct threat to me. She came and when the lieutenant governor comes, pulls you aside in a parking lot and says that these two things are connected, I know it shouldn't be, but they are and if you tell anyone about it, I'll deny it. She felt almost guilty about saying it. She knows it is wrong, but that is exactly what they're trying to do. CROWLEY: Do you think if you had stood up and discussed this conversation at the time it would not have gotten big play? I know you say you wouldn't have -- you don't think anyone would believe you, but it certainly would have put it out there in the local news media, probably the national news media, because of Chris Christie's profile? ZIMMER: I mean I don't think people at that time, I don't think people would have believed me. ZIMMER: So, you know, I basically again, my number one priority is looking out for Hoboken. So I decided that it was best not to say anything at that time because I wanted to make sure that Hoboken still had had a chance of getting funding and I thought if I came out with that, then we surely wouldn't get the funding. So it was a decision that I made at that time. CROWLEY: I want to read to you a part of what Chris Christie's spokesman, Colin Reed, had to say in a statement to CNN in which he said, "it's very clear, partisan politics are at play here as Democrats mayors with a political ax to grind come out of the woodwork and try to get their faces on television." As one of the faces on television, I'm going to give you a chance to respond to that. ZIMMER: I mean I'm not surprised that they are taking that approach, but in some ways I am. I'm the one that has stood with Chris Christie from the very beginning. I mean I hosted him in Hoboken for his first town hall meeting on the 2 percent tax cut. I stood with him on arbitration. We've had, you know, every interaction that I've had with him, it's been a positive interaction. And so I'm not surprised that they're trying to take this approach but I'm not -- I haven't been a part of the Democratic machine, so to speak, and so I mean to me, it's just - it's a deflection. You know again, they're not answering the core question and the core question is, did the lieutenant governor say what she said. And they're not even answering that in their statement. They're hiding behind spokes people. She herself wouldn't get on the phone. When she answered the phone, she literally -- they got her on her cell phone and she said, you know, I can't respond, my spokes people will be responding. Well, when it comes time if they are asked to testify, it won't be their spokes people who are testifying. It will be her testifying and she will be asked under oath and I think that she will be truthful and the truth will come out. For me the bottom line is actually, you know my -- the governor got a lot of support. He got a couple hundred more votes than me in Hoboken and most of my supporters support Governor Christie. So I -- yes, I am a Democrat, but I'm someone that, you know, has been extremely supportive of the Christie administration and I have worked closely with them on a number of legislative issues. They really helped us with our hospital. So I'm not in that, you know, mold, so to speak. I'm a different face. And if they really look back and reflect on that, they know that is the truth. CROWLEY: In fact the governor's office told me they were kind of surprised by this on Friday. They thought the relationship between you and the governor was quite good and that in fact you were in the governor's office, not meeting with the governor but meeting with some of his officials as late as last Thursday. So the relationship is still OK? ZIMMER: Well, actually, they were in my office. There was one representative from the governor's office. There was New Jersey transit. A rebuild by design team, an international design team and we were talking about this plan, this competition that we're a part of under HUD secretary, Donovan. It is an excellent competition that, you know, we're working on a comprehensive plan to really protect Hoboken and really hoping to move that forward. But my concern is that the governor ultimately will not support this plan unless I move forward with the Rockefeller project. And if I don't have his support on this plan, then we're not in a good position to win this competition. So that's my frustration and that's my concern. And again, I'm trying to do what -- you know, what I think is best for Hoboken and you know, I also felt as more and more comes out about bridge-gate, that I had an obligation to come forward because I think there are some strong parallels here. CROWLEY: And you would - you would concede as a politician yourself that the Christie camp would look at this and see this as piling on or supporters of the governor would say, this looks like Democrats piling on and sort of keeping it in the news. ZIMMER: I'm sure they would look at it that way but it really -- to me, that's a deflection. Again, have they answered the question, did the lieutenant governor say this to me? They have not directly responded to that question. Did they tie Hoboken Sandy funding to the Rockefeller project and, yes, they did. That is a fact and they have failed to respond to that to date and they have failed to respond to it directly. We have not heard from the governor directly. We have not heard from the lieutenant governor directly. And again, I believe if she is asked to testify that she will be truthful around the truth will come out. CROWLEY: So my last question is, when this was going on when you're in the parking lot having this discussion with the lieutenant governor, there is a part of me that says this takes place in politics a lot. I mean to the winners go the spoils. I mean the (ph) people go, you know, you got to go with the governor on this because it makes it really hard to do this, or et cetera. But when you were having this particular the conversation did you say, this sounds illegal, this sounds like a shakedown. I mean at what point -- where do you think this categorizes in the kind of really, really hardball politics or did it occur to you was illegal? ZIMMER: Well I mean, what I thought was, this is a threat. I mean this is a threat and this is wrong, this is not fair to Hoboken given the devastation that we had. Our city was severely flooded. 80 percent of the city was underwater and this is not fair what she's asking me to do and it's not fair to hold those Sandy funds hostage in exchange for one development project and what she was asking me to do was really unfair and just not possible. As far as whether or not, I think it is something for others to look at as far as whether or not it crosses that line. But I know from my perspective just was not fair and it felt like a threat. CROWLEY: Almost guaranteed to be continued. 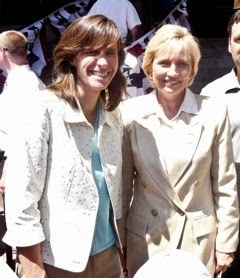 So I want to thank you so much, Mayor Dawn Zimmer. I appreciate your time. ZIMMER: Thank you very much.